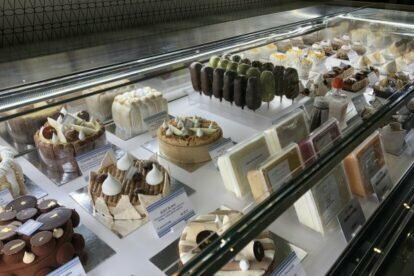 Une Glace a Paris – Ice creams that melt you down! Yesterday I ended up at Une Glace a Paris when all my choices had disappeared, and I was really lucky. Actually I was there to buy a cake for my daughter’s birthday but couldn’t be there before it was evening. By the time I got to all the shops, the nice cakes where you can put the candles were gone. After running around visiting some of them, I ended up in the nice and stylish shop of Michalak, but they only had macaron sweets. Looking through the window I saw this ice cream shop and decided to try. To my surprise, they do not do ice-cream balls on cones, but fantastic high quality cakes that contain ice cream. All the fantasy you can imagine, with an awesome taste, in a cake. I wondered if this would last the half-hour ride home, and the shop attendant told me that they sell their cakes in a isotherm box which keeps them good for at least 1 hour. I had found the solution!!! I chose a savarin with caramel and chocolate. It was indeed a great choice. Amazing flavour that you can chew but also melts in your mouth, with a beautiful appearance. The chef is a prize-winner ice cream artist and one can feel it. All their cakes are manufactured in their laboratory downstairs using top quality ingredients. Definitely worth having one of those always in the freezer!